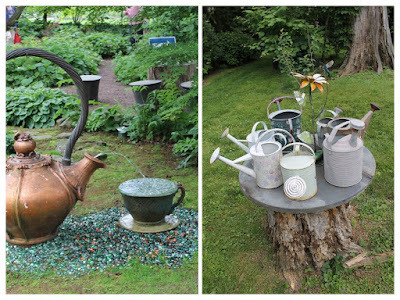 I took some wonderful garden tours this month beginning with the Pennsylvania Horticultural Society's Ambler Garden Tour near Philadelphia and ending with the Monroe County Garden Club Tour in Stroudsburg. 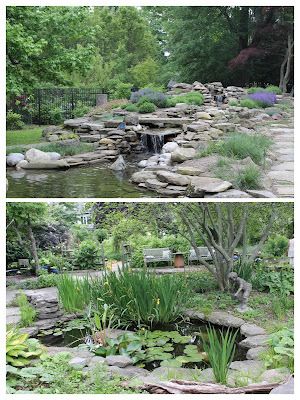 The highlight of the Ambler tour, for me, was Northview Gardens, home of Jenny and Gus Carey. 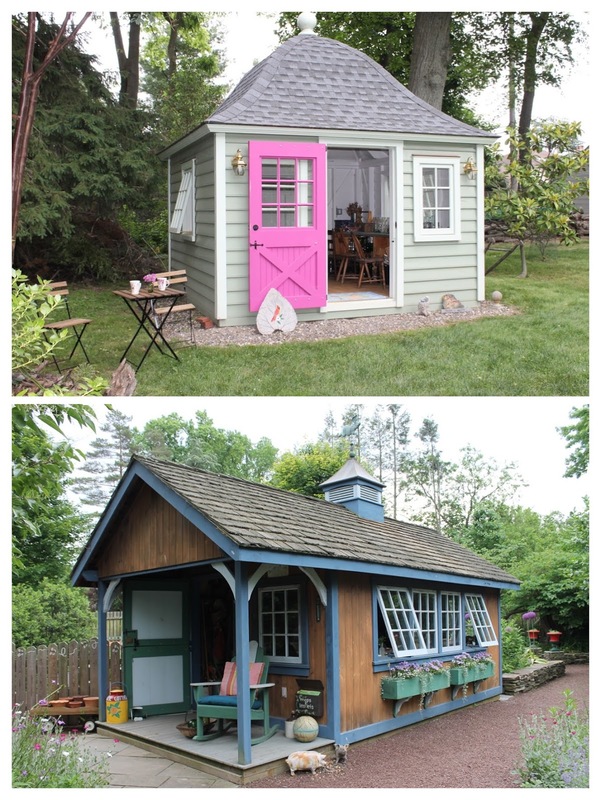 You may remember Jenny Rose Carey from previous blog postings: click here and here to learn more. Jenny Rose is the author of Glorious Shade and I was anxious to see the gardens for myself, having spent hours poring over the beautiful photographs of them in her book. Northview covers 4 1/2 acres with 31 distinct areas: from the Blast From the Past Garden, Italian Garden, Dry Garden, Herb Garden, and Victorian Stumpery, to the Fountain Garden to name a few. I cannot begin to do justice to these fabulous gardens in the space of my little blog and include just a few photographs here. 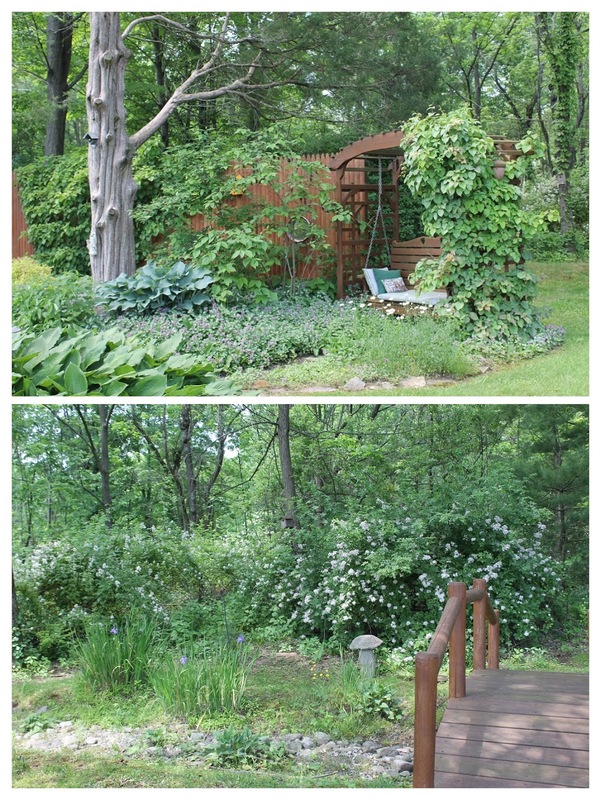 The lead picture above shows some of Jenny Rose's June blooms -- of course they were way ahead of ours in the Poconos. Note the bottom left picture of the three -- that is a Blacklace elderberry Sambucus nigra with a rose entwined through its branches. 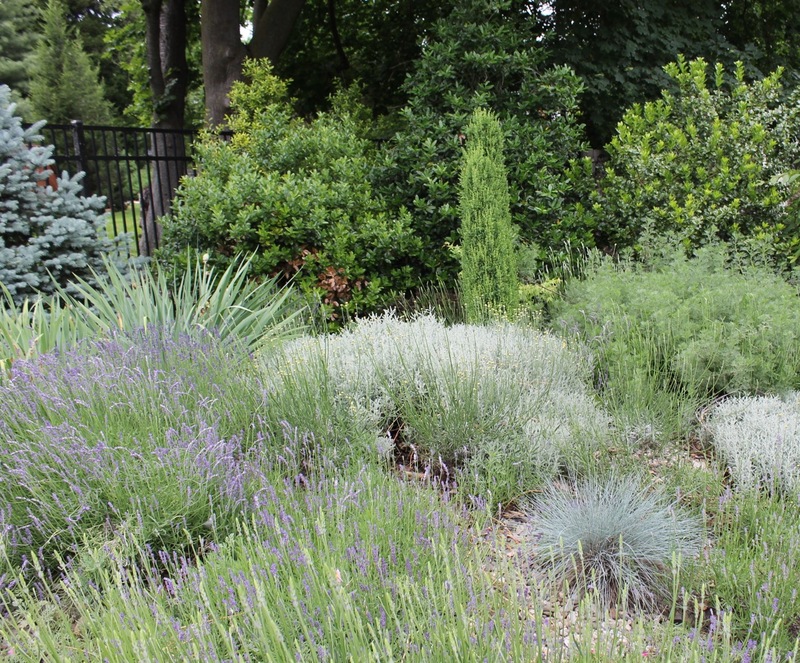 This is typical of the beautiful plantings throughout the gardens. 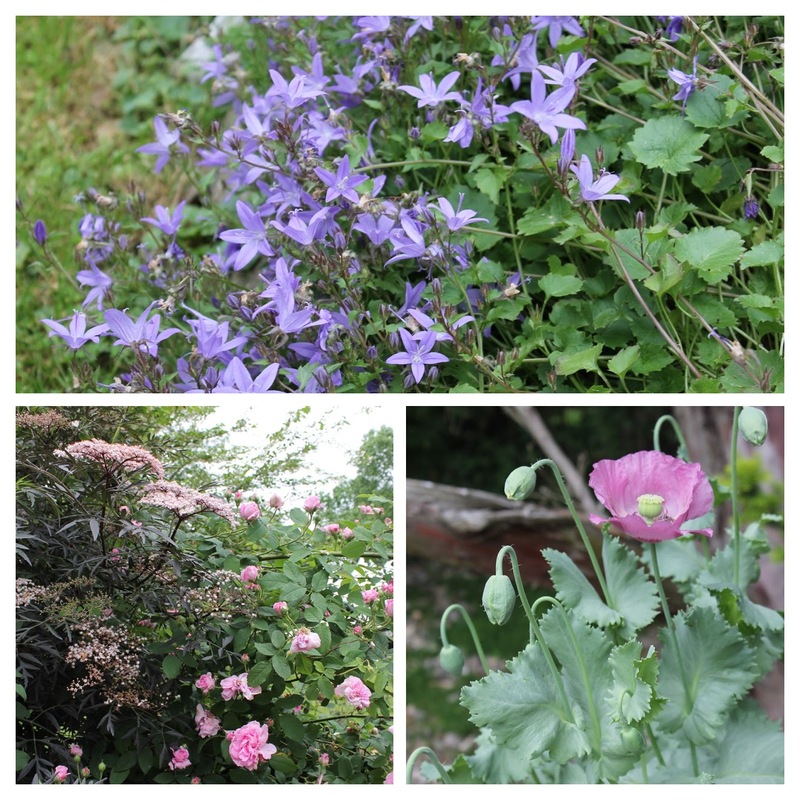 Don't you love the pink of that poppy and the deep blue of the bell flowers? 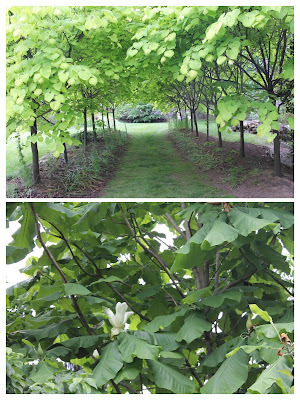 Top: Redbud Allée. Bottom: Magnolia macrophilia. 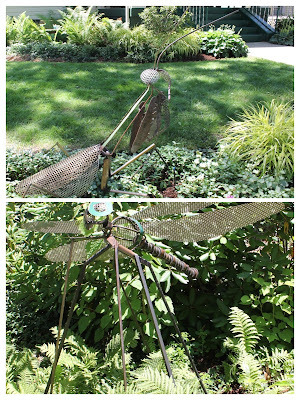 Jenny Rose practices sustainable gardening, using no pesticides. She mulches with leaf mold, pine needles, and small rocks. 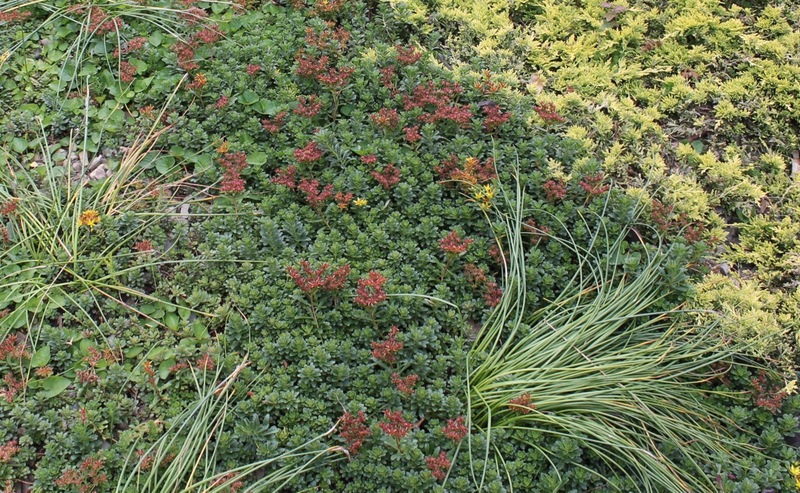 She also uses ground covers such as the patchwork of sedums pictured below. Since the tour I purchased a tray of various types of sedums which I planted hoping they will form, eventually, a small patchwork quilt under my delphiniums. 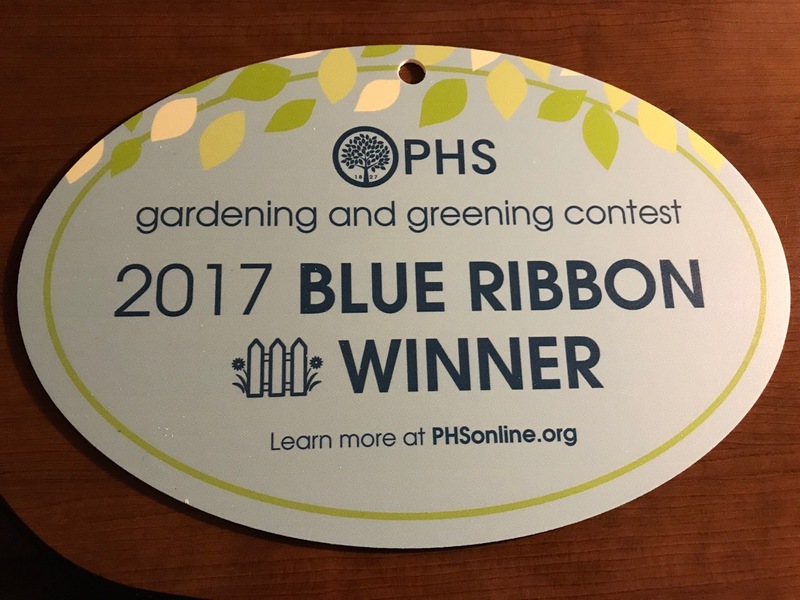 Well, that's one of the reasons for garden tours, isn't it -- to find ideas you can use in your own garden? I do like to use ground covers rather than mulch. And mulch was on my mind during this tour -- I'll explain this later. Various sedums form a patchwork ground cover. 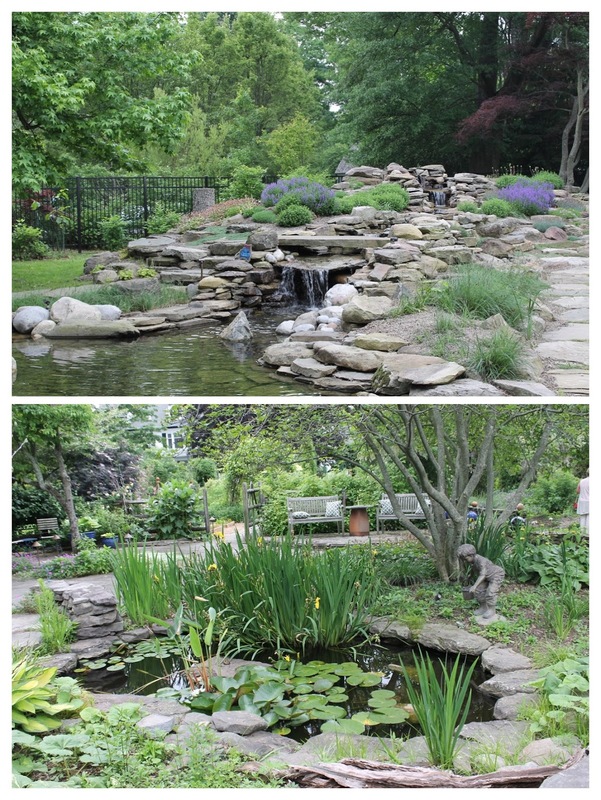 Top: The Waterfall Garden. Bottom: The Pond Garden. Finally (yes, I know there was so much more), I loved the many whimsical elements at Northview, but my favorite was the copper teapot fountain. So appropriate for an English gardener. I hope you enjoyed this little taste of the loveliness that is Northview. 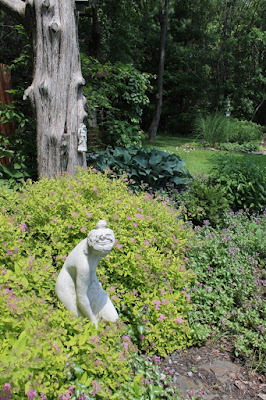 There were several other gardens on the Ambler tour and I will feature one more here. This beautiful garden, originally part of the estate of an adjacent manor house, has a Tuscan flair with its fountains, stone walls, circa 1880's wrought iron, and flagstone terrace. As we climbed the hill to the property, I immediately saw it as the antithesis to Northview. 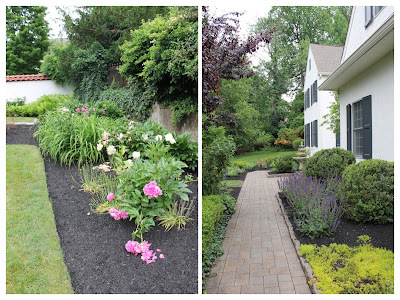 With the straight lines of the flower beds and the neat, black dyed mulch, this garden has a very definite 'landscaped' look that is in stark contrast to the naturalistic feel of Jenny Rose's garden. The type of mulch a gardener chooses is based upon personal taste. Until this year, I used black dyed mulch on my beds; I like the way black mulch makes the flowers 'pop.' But lately I've had the desire for a more natural, organic appearance. Comparing these two gardens reinforced my feeling that I should give black mulch a rest. Straight lines, black mulch. 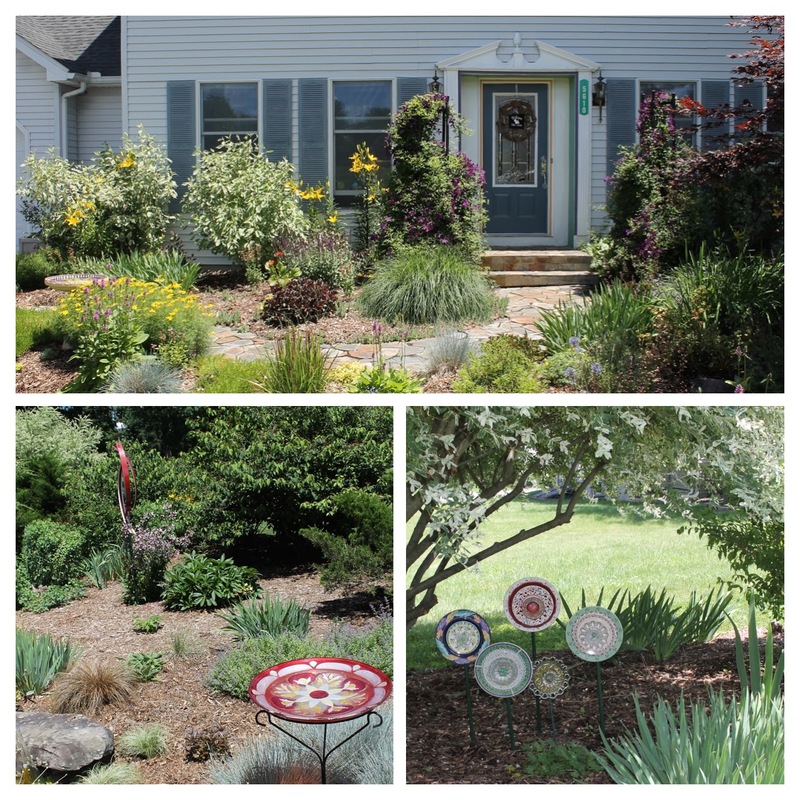 A beautifully landscaped property. The question remains, if not black-dyed mulch then what? 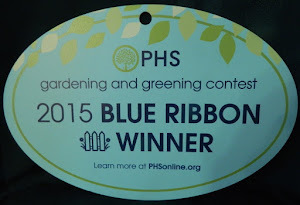 In the vegetable garden I use cedar mulch because it contains a chemical that limits bacterial and fungal growth. It is brown and has medium-sized flakes of wood in it. While it is great in the kitchen garden, I don't like the way it looks in my flower beds. 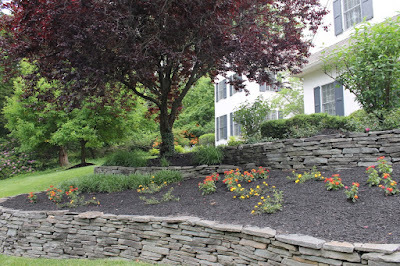 As for other mulches: I don't have enough leaf mold, there are pine needles in the Woodland Walk only, I don't like rocks as mulch except in a dry garden. I must use mulch of some sort, however, to suppress those darn weeds and stop the rain from splashing soil/mud up the siding of the house. I puzzled about this for a few weeks. 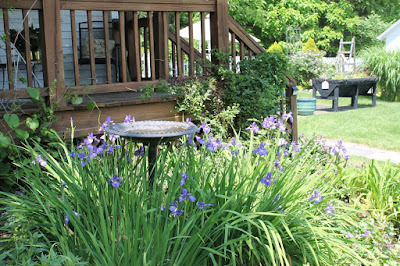 Hostas and a bog garden in Barbara and Kerry Teats' garden. Robin and Brad Teets' entry garden and her glass garden art. One of my favorite properties on this tour has a stunning entry garden with a curved, stone pathway up to the front door. Instead of the usual shrubs in the foundation plantings, there are colorful perennials and vines. 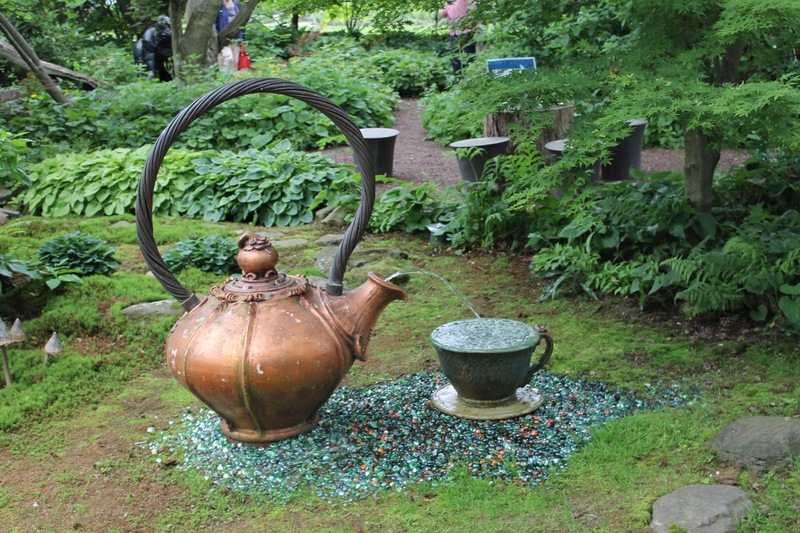 The large garden at the back of the house features several bird baths and sculptures made of glass -- the repetition of glass material giving the garden cohesion. 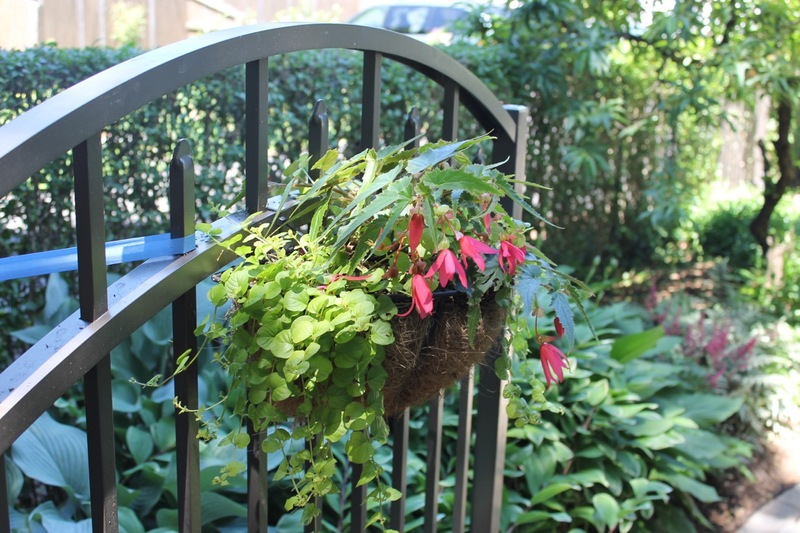 Another idea to copy: the gardener buys large glass plates from flea markets and thrift stores and places them on plant stands for inexpensive and very attractive bird baths. BTW -- she uses a finely shredded brown colored mulch and it looks quite natural. So where am I with MY mulch problem? 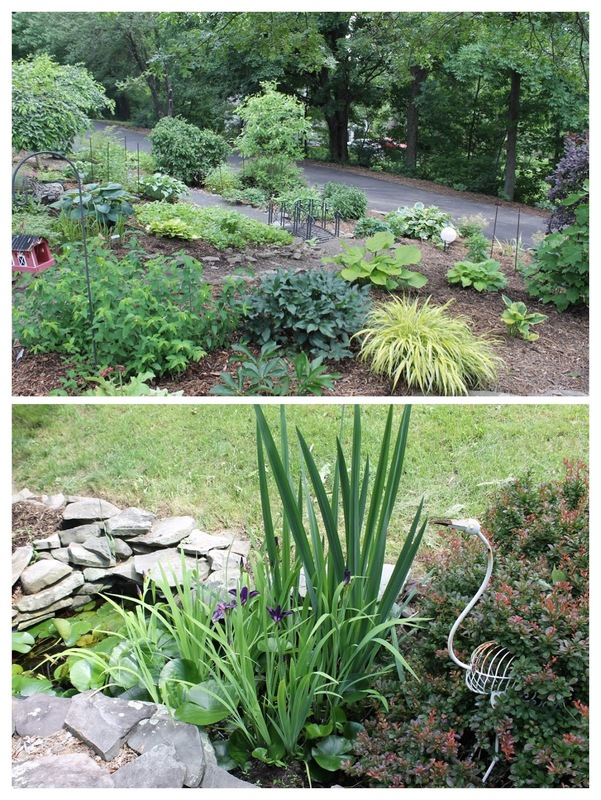 I processed my experiences from visiting a multitude of gardens, did research online, and reread the section on mulches in Jenny Rose's book. Then it came to me! Natural cedar mulch that is shredded as fine as possible! I'll let you know how it works out. Happy Fourth of July to all my American friends! I love reading your comments. I hope you leave one so I’ll know you visited! I look forward to visiting your blog in return. 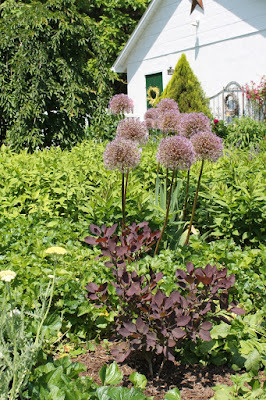 In June my cottage garden is regal with red peonies and purple alliums. The burst of strong color follows a gentle May with its pure whites of viburnum and bridal-veil spirea. May followed a golden April full of daffodils. 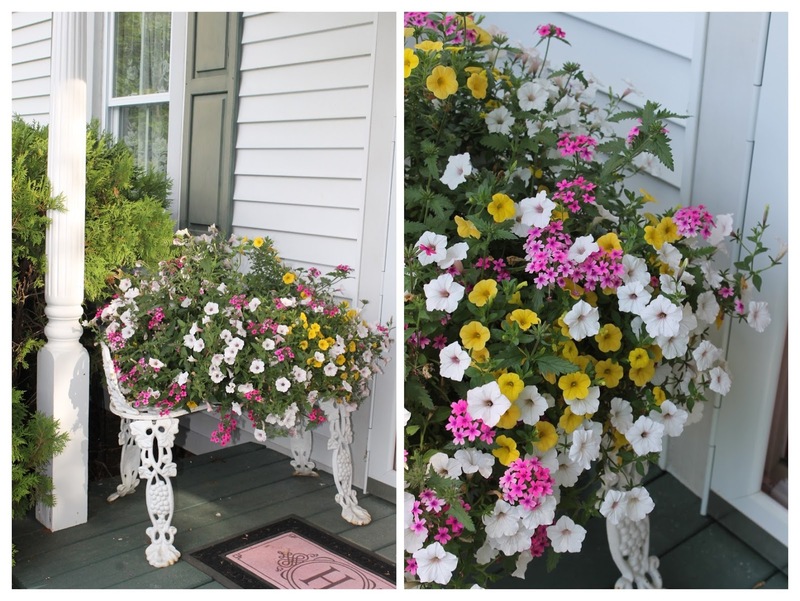 The hues of my June flowers put us in the mood for a riot of color that is the cottage garden when it peaks in July. Today we are in the middle of an early heatwave with temperatures in the 90s and high humidity. This is a good day to stay in the air conditioning and write. 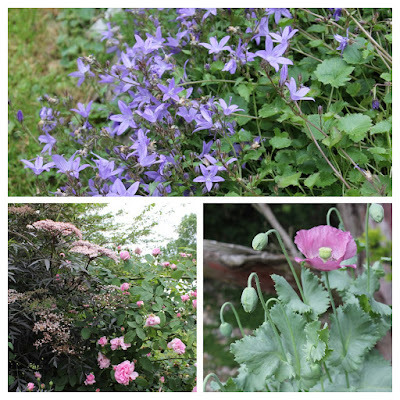 But first, let's take a walk around my June garden in the comparative cool of the early morning to see what is blooming. Adding to the purple theme, my new smokebush is leafing-out nicely. It has tiny white blossoms -- who knew? You can just see it's delicate flower in the picture above. 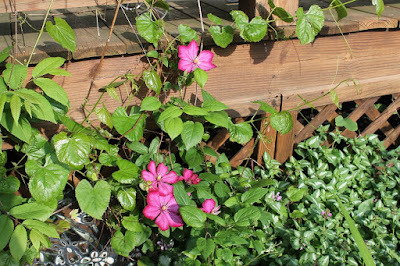 The first clematis to flower each year. I don't know it's name. 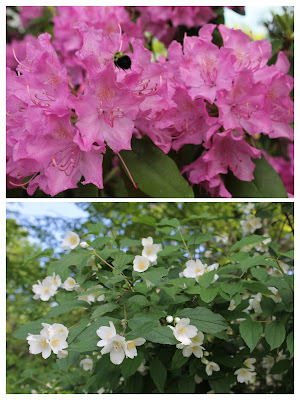 When describing June in my garden, I have to include rhododendron and mock orange. They bloom early in the month and today most of their petals have fallen. 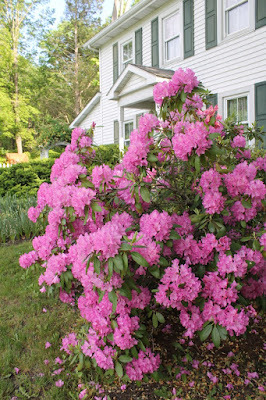 The blooming rhododendron was magnificent this year; the mock orange filled the June air with its heady scent. 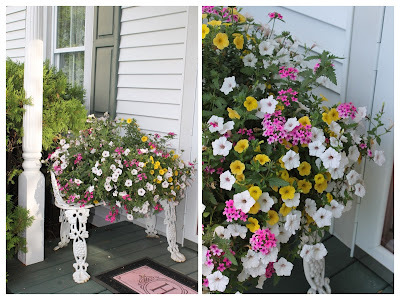 I placed a tub of mixed annuals in pastel shades on the front porch. Their gentle hues offer visitors a sweet-tempered greeting. 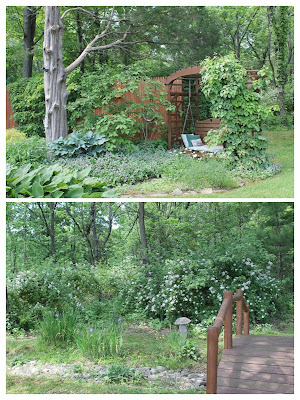 Walking through the Serenity garden I am happy to see the climbing hydrangeas have some blooms. I'm not so happy to see multiflora rose beyond Bluebell creek. Its flowers are lovely and its scent is divine, but we wish we could eradicate this invasive shrub, our biggest gardening challenge. I wrote about it in detail here. 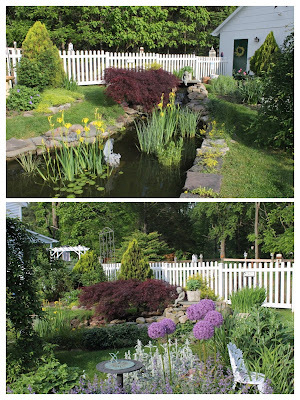 Serenity Garden above; Bluebell Creek below. We will NOT go into the Woodland Walk since that's where the bear may be hiding out. He came onto the back porch and broke my favorite hummingbird feeder to drink the nectar. 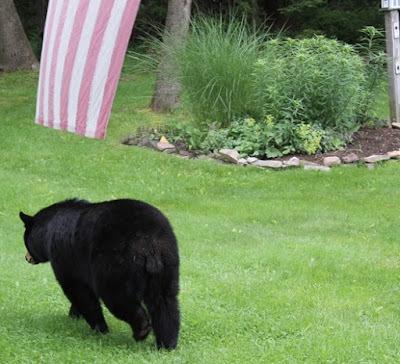 Black bear leaving my porch and heading for the Woodland Walk. 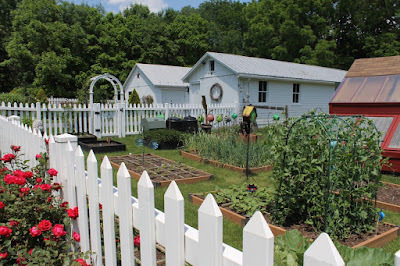 Finally, let's check out the kitchen garden where the vegetables I sowed germinated. What a miracle it is -- I'm always anxious that they wont and I'm filled with excitement when they do -- it never gets old. Blossoms on the snow peas promise we'll have some tasty meals very soon. Oh, and please read my contribution to the Garden Writing Association's blog, GWA Grows, about what makes a great blog. The article has tips from me and from some other bloggers you may know, including Carol from May Dreams Gardens. 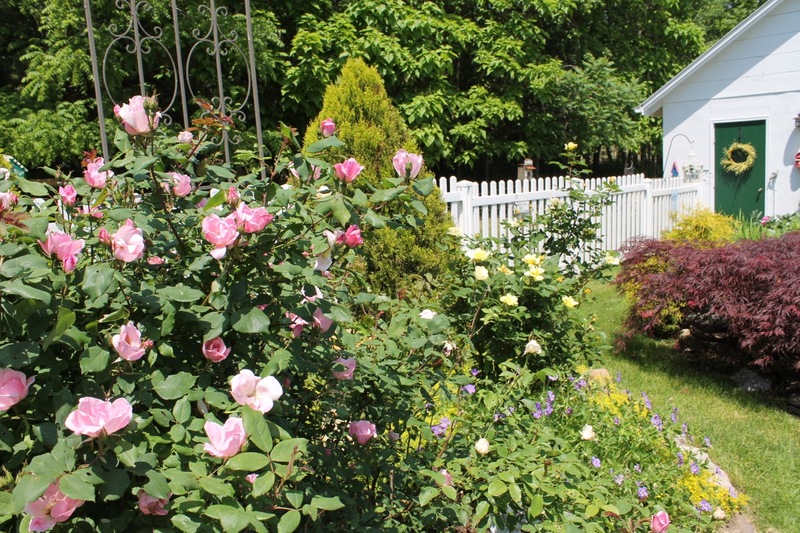 Enjoy June, dear gardening friends. 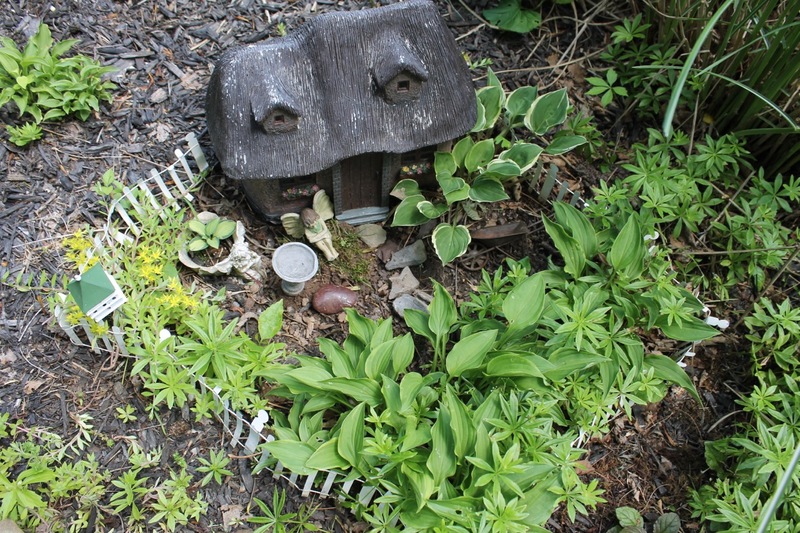 One of my five fairy gardens. 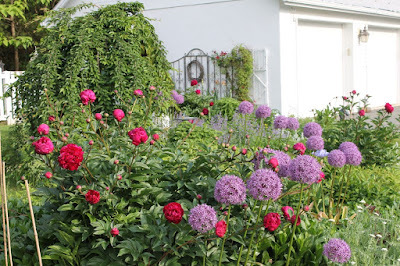 I long for my Grandmother’s garden in England that I remember as a child, and I am trying to create something similar in the Pocono Mountains of Pennsylvania. My husband has lived in this house, Astolat Farm, all his life. There are 24+ acres: 8-10 of them are farmed; the house (circa 1850) is on approximately three acres that are gardens, potential gardens, and pastures for my miniature horse and pigmy goat; the rest is wooded. 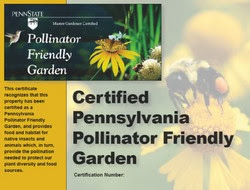 We are located in USDA hardiness zone 6 (but it's really zone 5.) 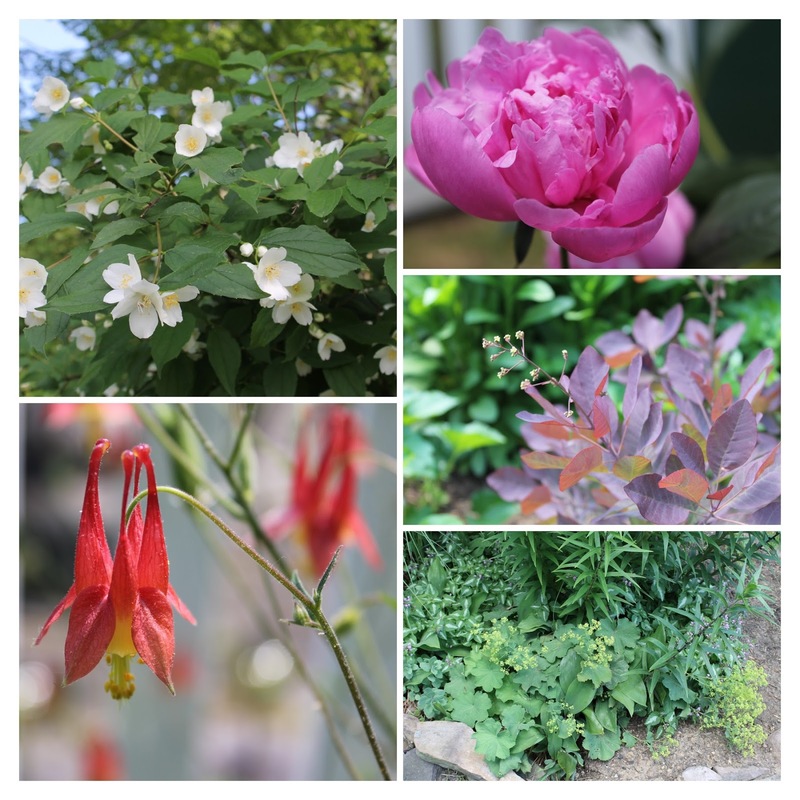 I am a garden writer and photographer. I write a monthly article for the Pocono Record with topics of interest to the home gardener.